Garage: "Garage: 3 Car Attached; Parking Space(s): 3"
Lot Size: 9198sq. ft. 21ft x 43.8ft "Backs on to Park/Green Space"
1650 square foot 3 bedroom house available in the town of Shields on Blackstrap Lake. Why not live at the lake and work in the city? If you are looking for a cabin this is a wonderful solution since it is only 20 mins from Saskatoon you can also enjoy the cabin on week nights as well! The main floor is open concept with breathtaking views of the lake. The two-tone kitchen features a large dark Norwegian Granite Island and light tone quartz countertops on the rest of kitchen cabinets. All appliances are stainless steel and include fridge, stove, microwave and dishwasher. The master bedroom has an ensuite featuring two sinks on a granite countertop and a natural stone floor in the shower. The master bedroom has a gorgeous barnwood wall and amazing views. The two other bedrooms are equipped with built-in double size bunk beds for those weekends where you have lots of company. The main bathroom has a tub and there is main floor laundry and mud room right next to the bathroom. The loft above the main level has stunning views of the lake to the east and sunset to the west. The large walkout basement has rough ins for the third bathroom. There is a large Rec Room and room for a 4th bedroom to be built in the lower level. There is a triple attached garage for all your lake toys. The oversized yard is ready for development. 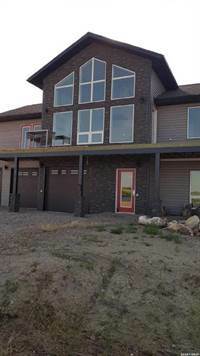 \r\nDon't miss out on this opportunity for a stunning lake property so close to the city. Don't delay...Its lake season call today!